Following his £16m move from Manchester United to the Emirates Stadium in the summer of 2014, the Englishman may have played just enough to justify his paltry price tag, especially considering the inflation of market price in recent years. However, everyone can agree that he hasn’t lived up to his potentials, and for a player who is approaching 28, it may be just the right time for Arsenal to sell and both parties can move on. According to Goal, Danny Welbeck would be leaving the Gunners together with a star teammate as Unai Emery looks to build a stronger team than the one he inherited from Arsene Wenger. Consequently, West Ham and Everton have been backed as the most likely destinations of the 27 year old. Crystal Palace have also been backed by bookmakers, such as betting top 10, as a possible destination. Danny Welbeck started his career at Manchester United amidst lots of pundit acclaims which virtually all English prospects have become accustomed to. He has the pace, and could play as a lone striker or on either flanks. He was meant to command his place in the English national team, and he did. However, as football fans all over the world get accustomed to English talents failing to live up to their gifts, Welbeck has come into that category. Similar to the case of his countryman Wilshere, injuries have not been favourable, and the forward has had to fight several injuries in all of his seasons at the Emirates. The presence of Unai Emery at Arsenal, as reported by The Sun, could be the catalyst needed to offload the Manchester-born forward. If anything, the Spanish tactician has shown in his early days in London that he isn’t scared of letting go of established players as evident in the exodus of Santi Cazorla and Jack Wilshere. More importantly, Welbeck’s place in this Arsenal squad is not assured. Upfront, he has to contend with Gabonese player Pierre Emerick Aubameyang and French forward Lacazette. On the flanks, he has Mesut Ozil, Aaron Ramsey, and Henrikh Mkhitaryan to compete with. The former United forward played a total of 41 games for Arsenal in the 2017/18 season, scoring nine goals which is a below par return. While the total number of games played for the Gunners might seem incredible, he played 28 times in the Premier League, with 16 of those as a substitute. His number of games in the Europa League (10) was as a result of Lacazette’s injury and Aubameyang’s inability to play for a second team in the competition. With the Gunners looking to fight City and others for the top place this season, they need to get rid of players that are not actively pushing them toward their grand goal, and Welbeck needs to create that extra space for one more top notch summer signing. Arsenal has been on an amazing run lately which culminated in 9 consecutive wins up until Saturday, when Middlesbrough pooped Arsene Wenger’s birthday party. In fairness to Boro, it wasn’t a stroll in the park for the Gunners as Petr Cech earned his pay with some excellent saves to keep the game at bay. On the other end of the pitch, Victor Valdes had a stormer and the scoreline was a reflection of the proceedings. With the Premier League shoved to the corner for some EFL Cup action, Arsene Wenger is set to rest his first team starters, allowing the second string side to take center stage. The official site showed pictures of the players training and it was nice seeing Carl Jenkinson in action. For a player that has missed so much action after suffering that nasty knee injury while on loan at West Ham, it would be a proud moment for Corporal Jenks wearing the sacred Red and White again. There would be wholesale changes to the squad with Emiliano Martinez in goal for Petr Cech. David Ospina is the club’s Champions League goalkeeper and possibly the FA Cup goalie, so I don’t expect him to be the custodian in goal against Reading today. In defense, I expect to see the British triumvirate of Jenkinson, Kieran Gibbs and the exciting Rob Holding playing alongside the fit-again Gabriel Paulista. These four players are badly in need of games and would be hoping the midfielders and attackers do their business to ensure they qualify for the next round. 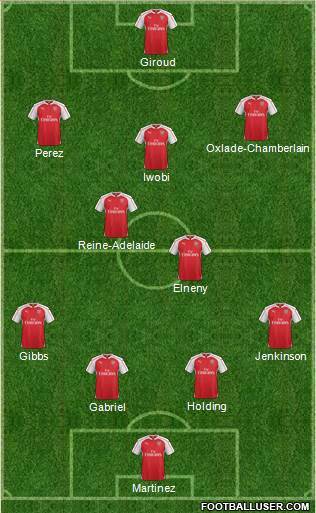 In midfield, I believe we would see Mohamed Elneny in action but with Mesut Ozil, Francis Coquelin and Santi Cazorla set to be rested, we could see Jeff Reine-Adelaide and possibly Alex Iwobi in the creative midfield role. I would also expect the ‘forgotten’ Olivier Giroud to be flanked by Lucas Perez and Alex Oxlade-Chamberlain. The Ox has been pushing hard for a starting berth and this would be offer another opportunity for the young Englishman to strut his stuff. Arsenal’s opponents will not be pushovers and the recent draw with Boro would be a stark reminder of the team not to underrate any side. Jaap Stam’s side aren’t doing badly in the Skybet Championship, fresh off a 1-0 away win over Rotherham that has seen them languish in eighth place. Reading has featured in three EFL Cup rounds before the draws cast them against the Gunners. They had already dispatched Plymouth Argyle, Milton Keynes Dons and Brighton. The Gunners will have to be mindful of John Swift that is currently leading the scoring charts for the Royals with four goals. Gooner Daily predicts a 4 – 1 win.